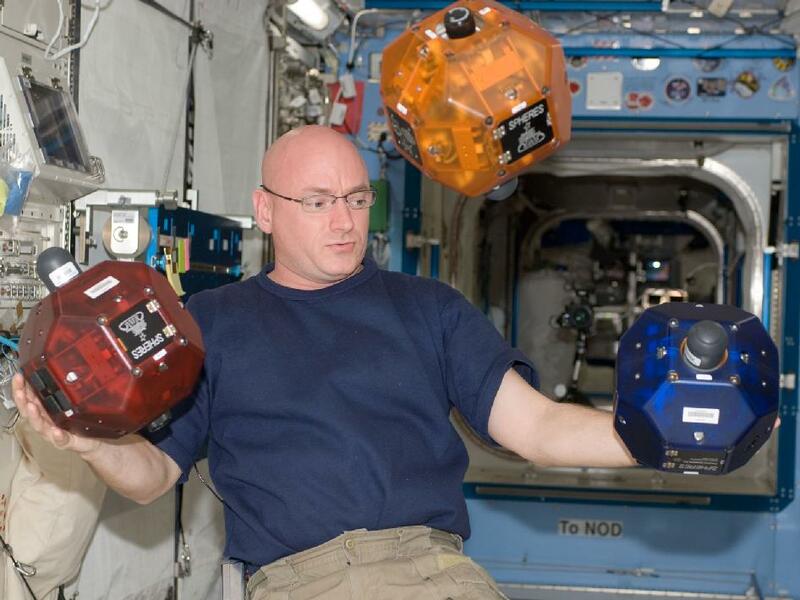 Astronaut Scott Kelly shows off the SPHERES satellites on ISS (Credits: NASA). In-orbit rendezvous is a potential solution to address space debris removal, considered to be the predominant issue facing the arena of outer space security and safety. DARPA, the US Defense Advanced Research Projects Agency, is using an unusual resource to develop rendezvous capability with out of control satellites: a high school competition. Participants in the Zero Robotics Autonomous Space Capture Challenge designed algorithms to control a bowling-ball-sized programmable satellite known as SPHERES. There are three SPHERES currently aboard the ISS for use in such experiments in an environment where there is no risk of losing the test subjects. The algorithms were applied across three different scenarios in which the SPHERES satellite simulated an active spacecraft approaching an object tumbling through space. Through the Phoenix program, DARPA aims to catch retired communication satellites in geosynchronous orbit in order to collect and re-use some of their components. For this purpose, the Phoenix spacecraft will have to perform a delicate dance to safely synchronize movements with tumbling satellites and to be able to deploy tools and attach or remove targeted parts. Extended use of such a technology could allow the removal of more general space debris like fragments from collisions and exploded rocket bodies or objects from extravehicular activities. The next Zero Robotics High School Tournament just started in September 2012. American high school students are once again being offered the opportunity to design experiments that will be tested aboard the ISS SPHERES.